Billed by Olympus as the ‘most advanced compact system camera ever produced’, the flagship E-M1 has a very impressive spec sheet. This new release follows on from 2012’s successful E-M5, which was the first advanced CSC from Olympus to feature an electronic viewfinder (EVF). The Japanese manufacturer is hoping it will be able to persuade professionals to ditch their D-SLRs in favour of this top-spec CSC, claiming that it outperforms ‘D-SLR cameras both in terms of size and imaging excellence’. While it’s certainly more diminutive than its D-SLR relatives (apart from the tiny Canon EOS 100D), can it really offer superior image quality? We got our hands on one to find out. 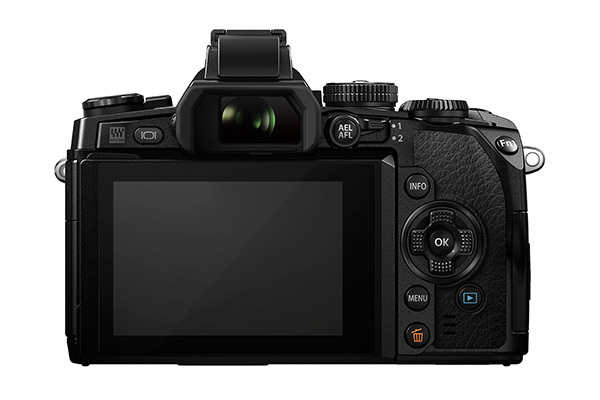 The E-M1 has grown in both size and spec when compared to its predecessor, the E-M5; and the most immediate thing to notice is the addition of a protruding handgrip on the right of the body, as well as a rearrangement of the button and dial layout. The body itself is constructed from magnesium and has a textured rubberised coating in the grip areas, and Olympus states the E-M1 is dust, splash and freezeproof down to -10°C. Buttons, dials and levers are scattered across the top-plate and rear, with the larger ones manufactured from metal, adding to the build quality. The mode dial offers the standard M, A, S, P, as well as Art effects, Scene mode, i-Auto and Movie mode – which is capable of shooting full HD video. Encased in a chunky, pentaprism-style housing on the centre of the top-plate is an impressive EVF, which is claimed to be 1.3x larger than the average D-SLR viewfinder. It boasts a 2360k-dot display with just a 29ms time lag – so quick it’s undetectable to the human eye. Colour, exposure and art filter adjustments are displayed in the EVF in real time, as well as a whole host of other shooting information. If you prefer to compose your frames on screen, then there’s a 3.0in LCD monitor which can tilt up and down to get those shots from high or low, and you can even focus or take a shot by tapping the screen. Sitting on top of the EVF is a hotshoe so you can attach accessories – such as a flash unit – and there’s one included in the box as the E-M1 doesn’t have a pop-up flash built in. Resting underneath the metal body is a Micro Four Thirds 16Mp Live MOS sensor, which has been teamed with a new TruePic VII processor to produce a remarkably rapid 10fps, an ISO range of 100 - 25,600 and an increased maximum shutter speed of 1/8000sec. The E-M1 also features a five-axis image stabilisation system, capable of combatting camera shake for vertical, horizontal, pitch, roll and yaw, to capture sharper shots. The previously acclaimed Olympus autofocus system has been improved upon, and the E-M1 brings us the premiere of Dual Fast AF, which utilises both phase detection AF and contrast AF – and it smartly switches to the optimum AF system depending on the lens you’re shooting with. A 12-50mm f/3.5-5.6 lens is included in the bundle (a more expensive bundle with a 12-40mm lens is also available), which has a film-equivalent focal length of 24-100mm, due to the 2x crop factor of the chip. Another feature of note is built-in Wi-Fi, so you can control the CSC with a smartphone or tablet – including the ability to switch shooting mode, shutter speed and aperture – without even touching your camera. The rugged, slightly angular metal body sits very comfortably under the fingers and the contoured and textured grip sections provide a sturdy purchase. The 710g weight (including lens) is pleasantly balanced and it feels like a quality camera in the hand. The design has seamlessly blended the retro aesthetic of the original OM series of film SLRs with contemporary features, and while the button layout is busy, it remains fairly intuitive to those used to handling high-end cameras. The metallic mode dial rotates with a healthy click and it can be safeguarded from accidental switching with a central pin lock. The ancillary dials are primarily set to control shutter speed/aperture and exposure compensation, but with the flick of a lever they adjust ISO and colour balance – providing more physical control with fewer buttons. The E-M1 manages to cram a remarkable amount of controls onto a small body, without it feeling swamped. The EVF is superb – it’s large, bright and incredibly intelligent – displaying adjustments in real time, and there’s no visible lag. The rear LCD screen is equally pleasing, and while it’s not a full touchscreen, you can set the focus with just a finger tap. Focusing is mostly fantastic on the E-M1 – it’s super fast and accurate – however it did sometimes go hunting on subjects lacking contrast, and in low light we needed to wait for the bright AF assist lamp to illuminate the scene. The face detection focusing also impressed as it precisely locked on to features to enable even faster shooting. The TruePic VII processor performed well in our tests. We were able to fire off a burst of 41 RAWs – at the top speed of 10fps – before shooting lagged as the buffer filled, and these files took 18secs to be recorded to the card. A single RAW took 1.3secs and when shooting Large JPEGs, we could capture 59 frames, with a write time of 10secs, and a single JPEG took 0.9sec to be saved. The E-M1 has a launch price of £1499 when bundled with the 12-50mm lens (£1299 for body only), and as such it’s clearly aimed at the serious end of the photographic market. Although the price is likely to drop in the coming months as retailer discounting kicks in, it’ll remain one of the pricier CSCs available; this simply reflects the features and technology built in. If you’re an advanced enthusiast after a top-of-the-range CSC, then the E-M1 is certainly well worth consideration as it packs an incredible amount of camera into a reasonably small body; butit’s difficult to envisage professionals hanging up their full-frame D-SLRs in favour of the smaller E-M1. Other top-end CSCs to consider are the Panasonic DMC-GH3 which has a D-SLR inspired design and costs £1599 with a 12-35mm lens; or the Fuji X-Pro1 which costs £1339 with a 35mm lens and has similar specs. If you’re looking to get a top performing camera that won’t take up much bag space, the E-M1 is certainly a smart choice. The E-M1 sits at the top of the Olympus CSC range, and the specs and the price reflect this. It’s a solidly-built camera and the retro-inspired design is blended well with the contemporary technology. The EVF is one of the best we’ve seen and the focusing system on the whole is remarkably fast and accurate. Advanced CSC users may find this camera meets all their requirements, though whether it can truly rival a D-SLR at the same price-point remains to be seen. This review was first published in the December 2013 issue of Digital Photo - download back issues here.